THE HEDONIST JIVE: "THE FRENCH CONNECTION"
For years I knew that "THE FRENCH CONNECTION" was one of the more thrilling, dark and exciting 70s films I'd ever seen, but outside of the landmark chase scene and some of the key plot points, I'd truly forgotten just about everything else about the film. I saw it for the first time over 20 years ago, so there you go. A lot's happened since then, right? As mentioned in my review of "Bullitt", I was jonesing for some 1970s cop thrillers and watched this and that back to back on one long plane flight, and needed a shower to wash the figurative dirt and grime off my body and mind once I got home. "French Connection" is a masterpiece, and a lot darker and even grittier than I'd remembered. 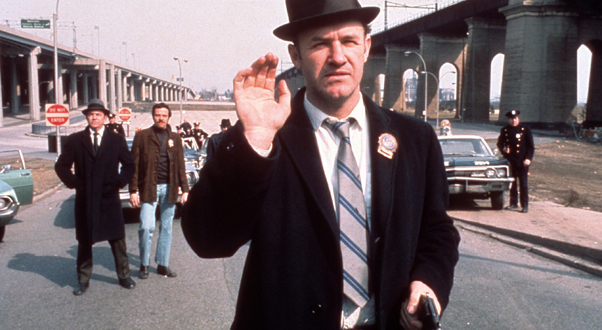 As amazing as the chase scene is – one long, traffic-crunching terror through Brooklyn as Gene Hackman chases a subway train that's been hijacked by the bad guys – there are two other things I'd forgotten that loomed large this time. First of all, Roy Scheider. This actor really needs to get his due. His middlebrow profile might be due to the fact that he wasn't really in "art" films of the 70s; Altman and Cassavetes and Polanski didn't use him; and he was the star of "Jaws" and a key player in "Marathon Man" and "Klute", the latter two of which are two of my favorite films ever. He's such a presence in the films he's in, and that wry, sardonic wit of his is put to great use in this one as well as the others. Secondly, "French Connection" is funny! I had forgotten all about the "bar bust" scenes, in which Hackman and Schieder (Popeye Doyle and Buddy Russo) do drug busts at two 100% African-American bars in 70s Brooklyn. Sure, afro haircuts are funny in and of themselves, but the patter between these two as they shout down the hustlers and players and try only somewhat successfully to scare them to death is priceless. They then head out onto the mean streets of Brooklyn, all hopped up on adrenaline, to kick each other's asses around the block just for fun. Then get drunk. Good times. The film, of course, turns very bleak and tense, particularly in its second half. Doyle and Russo (mostly Doyle) have a hunch about a massive drug delivery coming into NYC from France, but not a ton of evidence. The old-school beat detectives they work with think they're terrible cops. Slowly, the "French connection" starts to show itself, first quietly and subtly, then violently. Then there's the car/subway chase, one of the most heart-stopping scenes in film history. After this, it's tense, quiet and lean filmmaking a la "The Exorcist", director William Friedkin's 1973 follow-up to this one. The final scene in the abandoned island warehouse is sad, sick and tragic, while also being something of a triumphant redemption for Doyle in front of the fellow cops who didn't believe in him. Excellent piece of filmmaking from Friedkin across the board – totally glad I revisited this one.